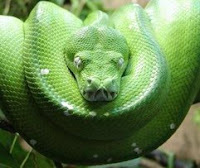 When discussing localities and races of Green Tree Pythons it is important to consider the geographic barriers of the region. 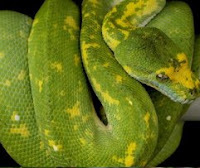 The Papua New Guinea mainland is divided into pockets of Chondro habitats by a central mountain range that at very least obstructs the cross breeding of localities and allows populations to develop in isolation. Generally we can state that there are strong racial traits amongst the north-western mainland localities that contrast to those of the south and south-west. The island populations are separated from the mainland group by water and have had millennia to develop in isolation. Hence, island specimens tend to display stronger racial characteristics then the localities of the Papua New Guinea mainland. Sorong-types are a sample of the specimens found in the north-western region of the Papua New Guinea island near the coastal city Sorong. They commonly develop a sky-blue dorsal stripe and markings leading to a long and pointed black or dark blue tail against a light grass-green body.These north-western Chondros are the smallest of the localities and their small proportionate features and vibrant coloration accentuate an overall graceful and pretty serpent. Presumably Jayapura-types are a sample of the specimens found in the central north-western mainland near the coastal city of Jayapura. 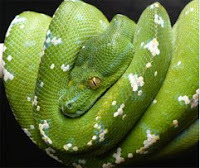 Like Sorong's, they also small chondros and commonly develop a blue dorsal stripe and markings; however, the pastel-blue dorsal markings and olive-green body give these serpents a distinctly prehistoric aura. Wamena and Central Highland types include the Arfak, Nabire, Lereh, and Cyclops localities. Highland animals are variable. 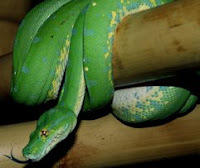 They are distinguished from the Sorong and Jayapura types by unique small tear-drop shaped dorsal markings. Generally speaking, blue scales on these animals tend to be less bright than other mainland types. Some specimens also display black pigment on the edges of their scales. Merauke and Port Mosresby are the southern coastal cities in the mainland of New Guinea responsible for exporting these south and south-western specimens. This locality produces beautiful and impressive animals with rich almost emerald green bodies split by a thin white dorsal stripe. The Merauke-type also extends to the south-western highlands, and it is possible that elevation may determine the appearance of the snakes. The theory is that higher elevations result in fully linear and more pronounce dorsal stripes. 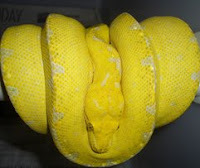 We should also mention that the only albino Chondro in captivity was hatched from Merauke parents. Papua New Guinea was once connected to the Cape York Peninsula thereby explaining the genetic relationship between southern mainland specimens and these “Aussie Greens”. 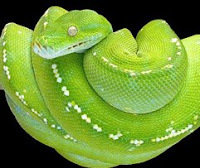 The most obvious visual trait of these snakes is the single row of irregularly spaced white or yellow scales on the dorsal ridge of a vibrant lime-green body. 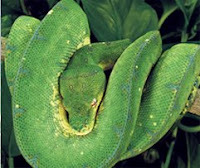 Aru Island localities are characterized by having specks of white dorsal scales against a green or blue-green body color. Older specimens may develop gray scales mixed in with the white. 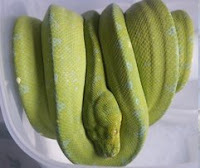 They can also develop blue side and dorsal scales, and frequently a light blue wash covers the lateral and belly area. Aru localities tend to be larger than the mainland type as adults average about 60 inches in length. Biaks are impressive beasts with robust heads, elongated dragon-like snouts atop a thick body. These are the largest of the Chondros. Their coloration is highly variable though they tend to be a predominantly olive-colored green. They typically have blotchy yellow patterns across their body particularly on their face and snout. The Kofiau Island locality refers to specimens collected off the small Boo island chain to the west of the Sorong peninsula. Little is known about this rather newly discovered locality other than the fact that some adults tend retain their yellow into adult-hood.